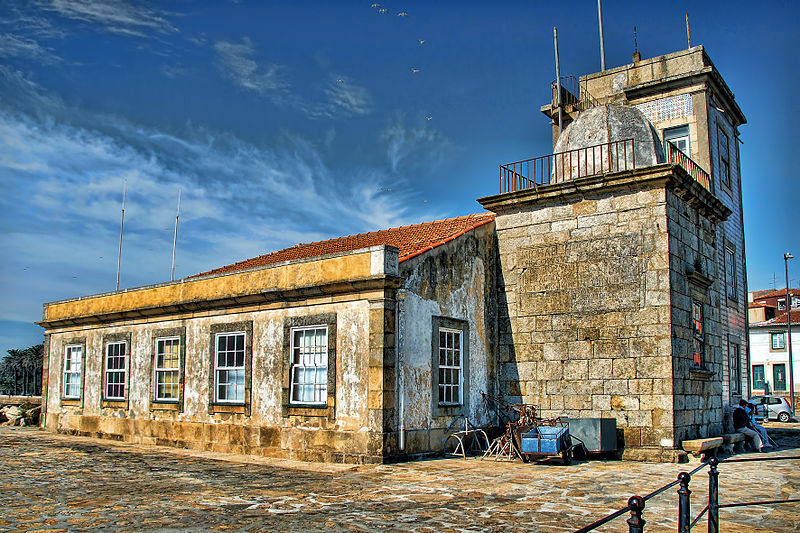 When travelling around such a beautiful country as Portugal, one will inevitably encounter monasteries, churches and chapels in the cities, towns and villages and in some cases on private properties. All are usually well maintained, either by the state or private individuals. One small chapel with a curious yet disputatious history going back centuries, has a story that is well worth telling. 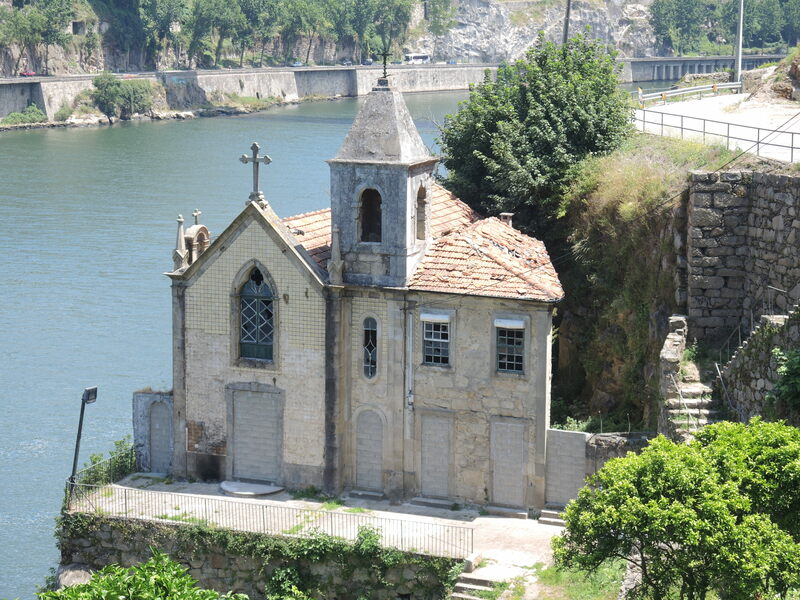 The name of the chapel in question is Capela do Senhor d’Além (Chapel of the Lord of Beyond) located in Rua Cabo Simão, Vila Nova de Gaia and which today sits forlornly, in a fallen state of decay, just above the River Douro on the escarpment leading up to the magnificent Serra de Pilar (classified by UNESCO as World Heritage). The story begins in 1140 when the then Bishop of Porto, D. Pedro Rabaldes, ordered the construction of a convent ‘Convento Donas Pregaretas de S. Nicolau’ for nuns on the site of the Serra do Pilar (an area originally known as Monte São Nicolau (St. Nicolas), Monte de Meijoeira or Monte de Quebrantões). At the time, local people worshipped São Nicolau, patron saint of travel, merchants and seamen at a very ancient hermitage on this site. A small dwelling and water fountain could also be found at the same location providing additional solace for those in need. One day a Crucifix was discovered and it would play an important role in the history of the chapel eventually causing a dispute between the peoples of Porto and Gaia. Unfortunately there doesn’t seem to be any documented proof of exactly how, when or where the Crucifix was found but two legends are told. 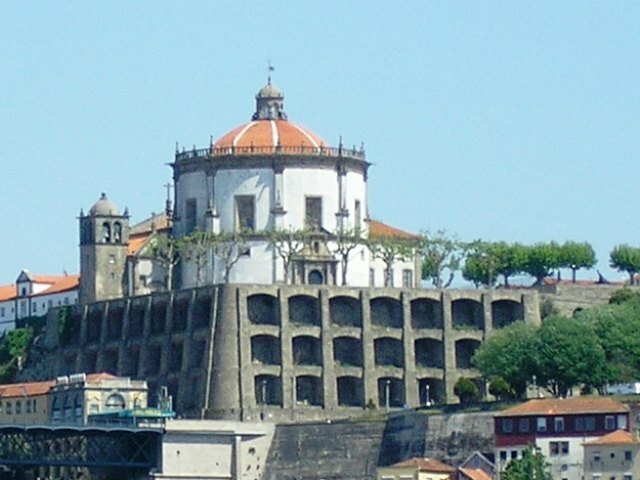 One mentions that it was discovered on the site of where the convent for nuns was being constructed whilst the other tells of when local fisherman from Guindais (a parish of Porto immediately across the river from the chapel) were fishing for shad in the Douro River, in front of what today is known as Senhor d’Além, when they pulled in their nets and found a Crucifix from the bottom of the river. In both cases the Crucifix ends up being displayed at the small São Nicolau hermitage where it could be admired and venerated by all. During the four centuries following, two similar situations occurred that would originate the construction of the small Senhor d’Além chapel. The convent at Serra do Pilar, through a shortage of nuns, had fallen into decay and so, coincidently, had the São Salvador Monastery for Augustinian monks at Grijó (originated in 922, reconstructed in 1142 – located approx. 25 kms south of Porto). 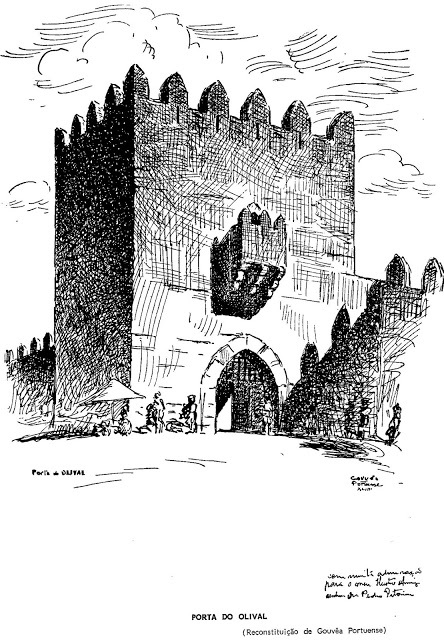 A decision was made by Father Brás from Braga (the appointed reformer of the Order of Canons Regular of St. Augustine) and the Bishop of Porto, D. Baltazar Limpo, under the consent of King John III of Portugal, that a new monastery be constructed on the site of the Serra de Pilar with construction starting in 1538 and concluding in 1670. During this time as well, the Crucifix’s importance became far more apparent and with the building of the monastery taking place and more space needed to expand the construction, D. Baltazar Limpo ordered that not only the Crucifix but two other statues: São Nicolau (St. Nicholas) and São Bartolomeu (St. Bartholomew), be collected from the now extinct São Nicolau hermitage and placed in the newly constructed Senhor d’Alem chapel (predecessor of the one that is seen today). This took place on 24th August 1500 in a ceremony accompanied by a procession of boats on the Douro River. Note: According to a letter from D. Baltazar Limpo dated June 17th, 1539, the statues of São Nicolau and São Bartolomeu were the property of the convent at the Serra Pilar which confirms that they did not remain at the Senhor d’Além chapel whereas the Crucifix did. 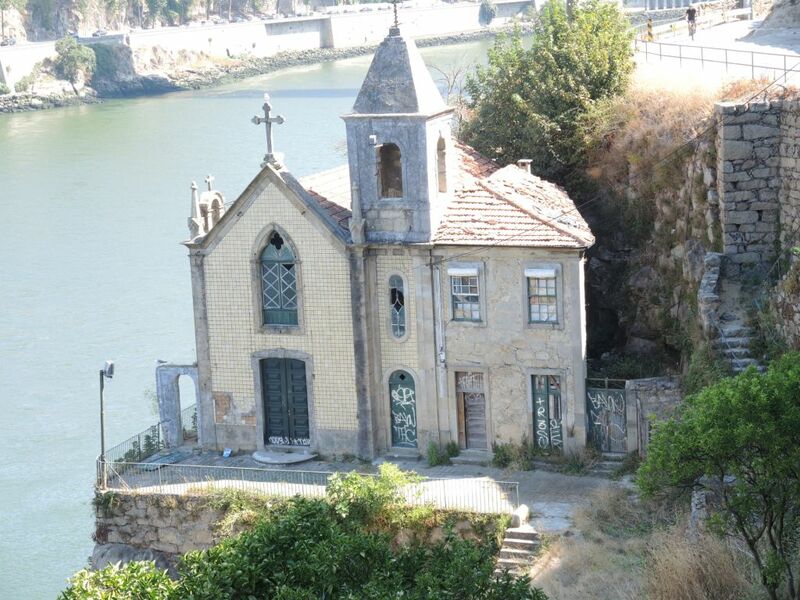 We can presume then that the original Senhor d’Além chapel was built in the late XV century and, as it was strategically close to the pier and a fishing settlement on the Douro River waterfront, it would become part of a rosary of other small chapels that dotted both sides of the river, fulfilling the daily religious needs of people connected to the river and the sea. 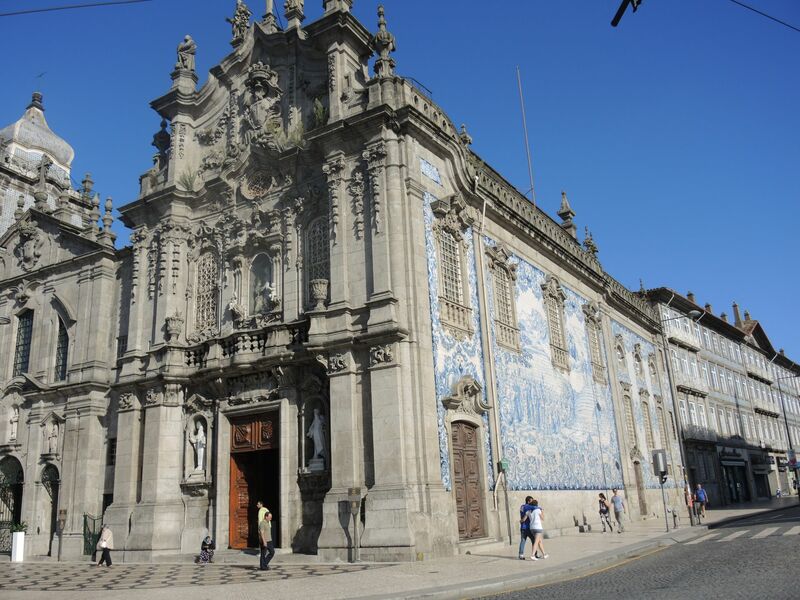 The chapel was administrated by the Porto Council and the Crucifix was revered by all where it would be paraded in ‘Prayer Processions’ by the people of the city of Porto not only in times of drought or floods, but in blessing to give thanks for special occasions. 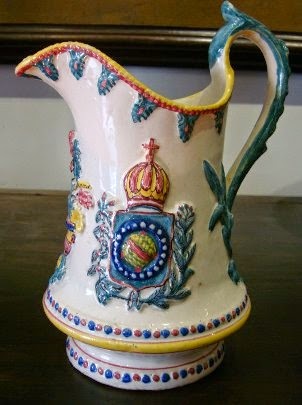 It would customarily be collected from the chapel and ceremoniously carried back across the river and through the streets of Porto to the Cathedral (Sé). Its return to the chapel for safekeeping would be performed in solemn procession through the streets of Porto, accompanied by the Chapter and other brotherhoods. 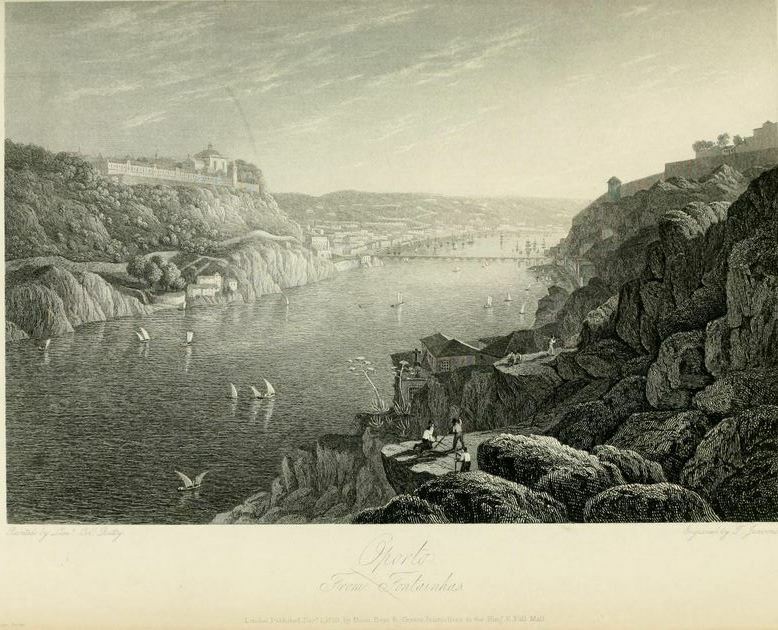 One recorded procession was in 1734, when the city of Porto was experiencing a severe drought and water shortage and a stately procession was held with it travelling on a boat downriver along the bar to the mouth (Foz) and back. These processions would be made up of richly decorated boats and accompanied by the city’s principal brotherhoods, secular clergy, noblemen and commoners. Another, according to the minutes of the town meeting which took place on November 18th, 1755 (two weeks after the city of Lisbon was destroyed by a terrible earthquake on November 1st and where Porto had escaped virtually unscathed), the Porto city Prosecutor suggested it would be fair to make a ‘Procession of Thanks’ to the Crucifix for this miraculous escape. Everything went normally until one day the Canons became upset with the Cathedral Chapter when they were asked to participate in one of these processions to return the crucifix to the Chapel. The Canons were of the opinion that the members of the Chapter did not have the authority to order them to participate in processions! Their reply was “that they would participate when they felt like it” and they retaliated by refusing to let the Crucifix leave the Cathedral (Sé). This would be the outset of a conflict between the Porto Council and Cathedral Chapter that would take a long time to be resolved. 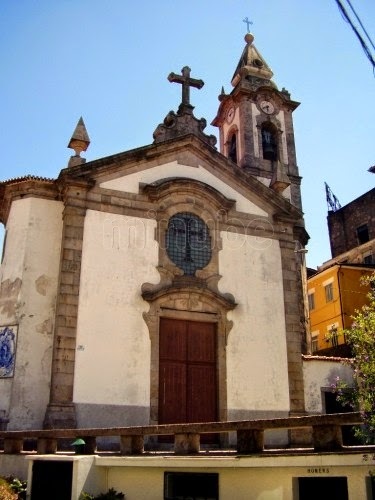 The Council aldermen also became offended at this situation as “wasn’t it they who were taking care of the Chapel do Senhor d’Além and the Crucifix“? They followed up with written request to the Crown Judge asking that as a gesture of goodwill the Crucifix be returned to the chapel as has always happened in the past. The Cathedral Chapter however not only didn’t allow the Crucifix to leave the Cathedral but did not respond to the Judge’s letter! With all that had happened the Gaienses (people of Gaia), felt mocked and betrayed at the Canon’s decision and in retribution devotees had a replica Crucifix made that would be revered in the same way as the original one. It came to play an important part in the lives of the Gaienses also being used in fluvial processions during droughts, plagues and other calamities where it would board a boat on the small jetty in front of the Senhor d’Além Chapel and travel downriver to S. João da Foz during which time devotees would pray to it from the banks of the river. At the close of these processions it would be carefully returned to the Chapel never returning their neighbouring town of Porto. 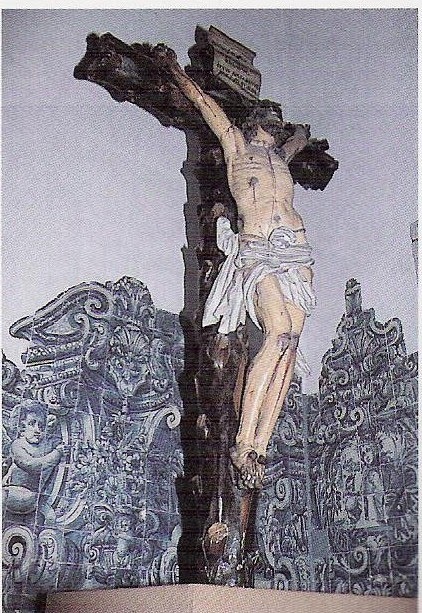 It is understood that the situation of the Crucifix was eventually resolved for some time between the Council and Cathedral and that it was returned to the chapel of Senhor d’Além. 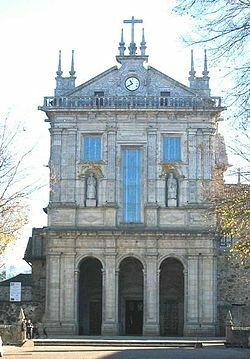 However to avoid further conflicts, instead of bringing it straight to the Cathedral as was done traditionally, it would be carried in a procession to the S. Miguel-o-Anjo Chapel in Foz and then down to the city through the Porta (door) de Olival (original entrance from the north of the old city and administered by the Porto Council) eventually passing to the Cathedral. 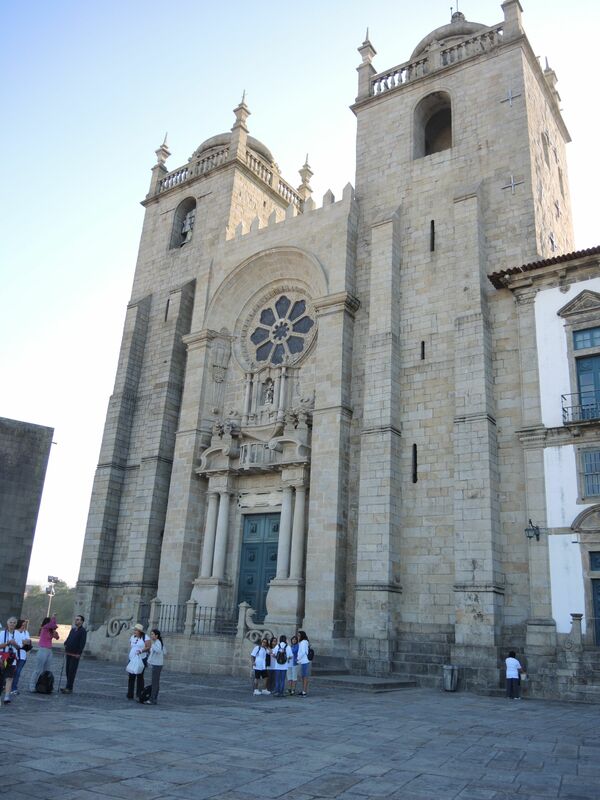 Today the original Crucifix sits in the Chapterhouse at the Cathedral (Sé) in Porto and the replica sits in the Santa Marinha Church in Vila Nova de Gaia. It is said that the reason for this is that during a very serious drought (there is no certainty on the date), it was collected and used in a procession through the streets of Porto for locals to pray for rain. When their prayers were answered and it finally rained, the Canons collected the Crucifix and never allowed it to return to the chapel again. Still today, devotees place olive oil lamps on the window facing the river towards the chapel of Senhor do Senhor d’Além. In 1877, the original chapel, now in ruins, was demolished and a new chapel with a bell tower and home for the parish priest (the one that can be seen today also now in a state of decay) was built higher up to avoid floodwaters. The chapel boasted large ornamental gilded carvings on the altar and had a copy of the Crucifix. Sadly today two of the bells in the tower have been stolen forcing the Parish of Santa Marinha to remove the other two for safe keeping. A unique selection of photographs taken by Alexandre Silva are available to see on his blog Monumentos Desaparecidos. He managed to get inside the chapel, at the invitation of two squatters, and take photos which show what the state of it is today. Sadly, after relocating the squatters to another residence), the council have recently ‘walled up’ all entrances to avoid unwanted entry and vandalism. Interestingly in 1738, right alongside the chapel, the first hospice was founded. On March 5th, 1739 five friars from the Order of the Barefoot Carmelites took over the hospice where it remained open until 1832 after which the State declared the closure of all convents and monasteries. With its huge leafy trees it was considered a favourite place for picnics and local festas, sometimes subject to floodwaters being so close to the banks of the Douro River. The Carmelites gave assistance to those in need who disembarked at the small quay close to the chapel. There was and still is today, an annual festival in honour of Senhor d’Além which occurs on the Sunday following the festivities in honour of Senhora do Pilar, falling on the second last Sunday in August. Note: Another excellent article from the blog ‘A Vida em Fotos‘ shows the beautiful trees around the chapel giving us an idea of what it would have looked like. Sadly all gone today. 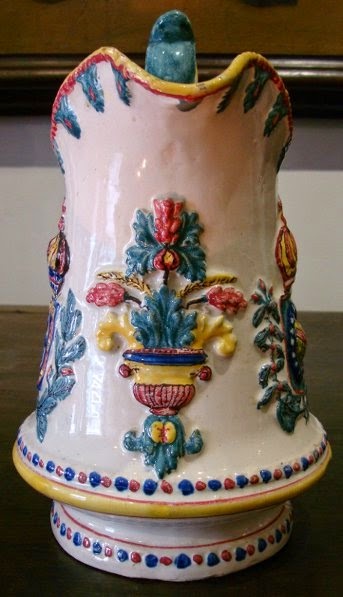 In 1834, the hospice building was sold at auction by the State and after some amplification was turned into a ceramics factory producing beautiful tiles and other ceramic articles. 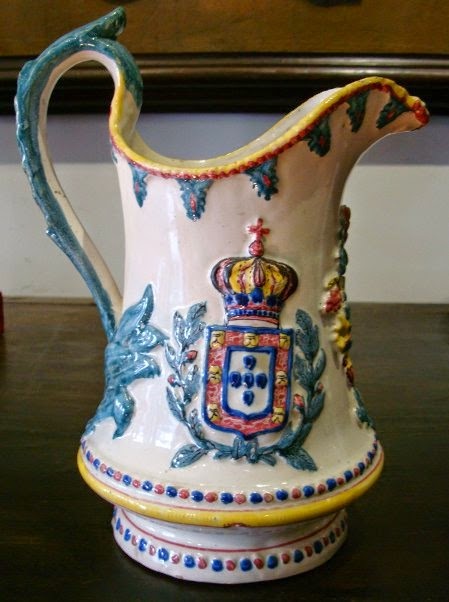 Two very different and beautiful examples of ceramics produced at this factory can still be seen today: the panel of blue and white tiles, dated 1912, designed by Silvestre Silvestri and painted by Carlos Branco, found on the Igreja do Carmo (church) in Porto and a very beautiful handpainted jug with the coats of arms for Portugal and Brasil (photos below courtesy of Tempo e Historias). 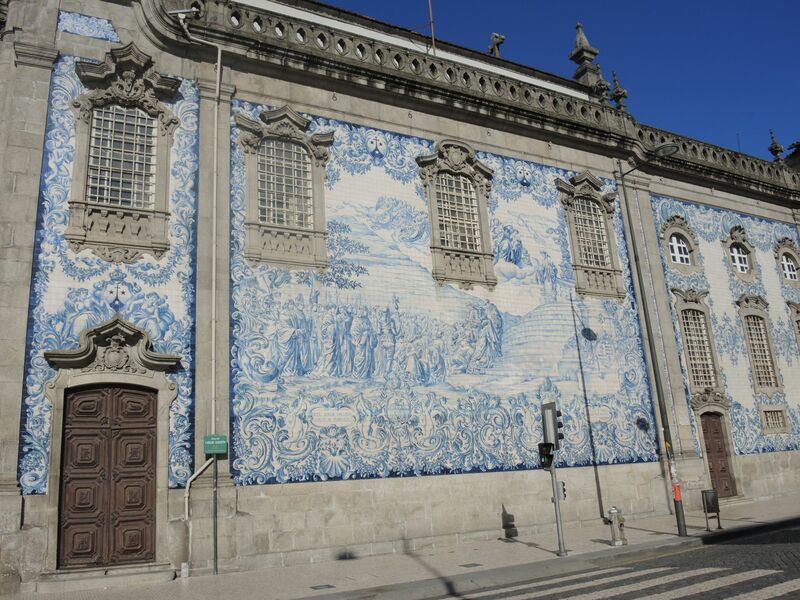 It is also very likely that the beautiful yellow and white tiles adorning the outside of the chapel were also produced at this ceramics factory. 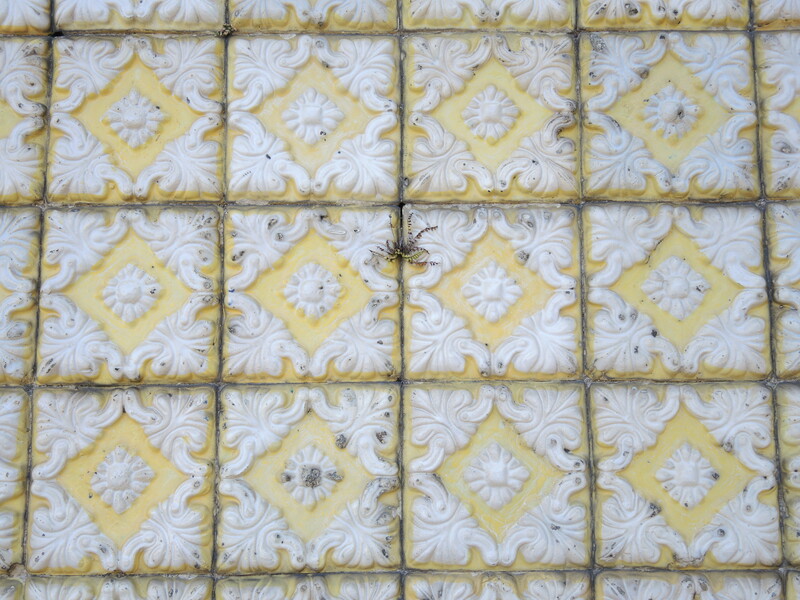 This style of tiles come in an array of colours and can be still seen today on many of the old buildings around Porto. And finally from the middle of the XIX century until the 1920’s when it was a ceramics factory using the same name as the chapel. And finally to close, a tribute to the Senhor d’Alem chapel and the area surrounding it in this lovely film by Reporter Ene. The chapel will forever hold its secrets from us. This entry was posted in Chapels, History of Portugal, Portugal and tagged Capela do Senhor d'Além, Crucifix of Senhor d'Alem, Northern Portugal, Porto, Portuguese Chapels, Portuguese Tiles, Santa Marinha, Senhor d'Alèm, Serra do Pilar. Bookmark the permalink.